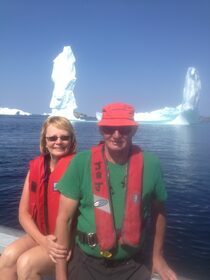 A truer Newfoundlander cannot be found, both were born and raised in Twillingate. Echoes of the Ocean provides a warm homelike atmosphere in clean, comfortable surroundings. On arrival, guests are provided with a wealth of information on all that Twillingate has to offer including walking/hiking trails, museums, boat tours, restaurants, nightly entertainment and much more. Located next to the beautiful Twillingate Harbour, guests can enjoy the sights and sounds of the ocean from our private dock or relax on our decks or large back garden. Each of our four spacious rooms have ensuite baths, queen beds plus added single bed in two of the rooms. Our smoke-free establishment is child-friendly with a huge garden for play and/or relaxation. We have a discretionary pet policy and parking is provided for all types of vehicles. Guests who are traveling with family and friends can take advantage of our self-contained option with use of kitchen and sitting room. There are two full sized kitchens and sitting rooms where our guests can enjoy the comforts of a "Home Away from Home".